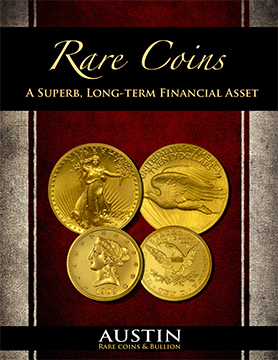 Austin Rare Coins, Inc. was founded in 1989 and is located in Austin, Texas. 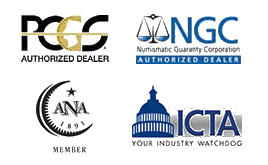 We specialize in serving investors, collectors, and fellow coin dealers. We are a privately held corporation whose officers, shareholders, and employees are dedicated to the privacy of our website visitors and clients. Our websites collect information from you when you order products, make requests, and register with us. The types of personal information collected at these pages: Name, address, email, phone, and credit card numbers. We use the information you provide when placing an order only to complete that order. We do not share this information with outside parties except to the extent necessary to complete that order or request. We use return email addresses to answer the emails we receive, and where possible, to deliver requested information to you immediately. On the day your order is shipped, we send an email notifying you of the shipment dates. Unless you request otherwise, we will occasionally send you emails or mail to your address regarding special sales, news related to products, or special releases, we feel will benefit you. We do not sell, rent, or loan our lists of information to third parties outside the ownership and control of Austin Rare Coins, Inc.
Each email we send provides you an opportunity to automatically opt-out of our emails at any time. You can update your preferences any time by emailing us at email sales@austincoins.com or mail us at Austin Rare Coins, Inc. Austin Rare Coins, Inc. 13809 Research Blvd, Suite 405 Austin, Texas 78750. Should you have other questions or concerns about these privacy policies, please call us at 1-800-928-6468 seven days a week or send us an email at sales@austincoins.com.